External 2 Bay enclosure, supports 68P SCSI Ulta Wide devices, uses HDD, tape drives & CD/DVD drives. Includes SCSI ID selector switch and cooling fans. Black. 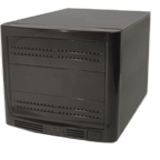 5.25" bays for easy mounting of 2 half-height or 1 full-height drive(s), backup tape devices, or CD/DVD drives.